Clinical top seed Novak Djokovic has crushed Frenchman Richard Gasquet's hopes of a first major final with a 7-6 (7/2), 6-4, 6-4 victory in their Wimbledon semi-final. Djokovic will meet Roger Federer in a sizzling final after the Swiss master beat home favourite Andy Murray in straight sets. Gasquet provided plenty of fight, primarily via the stylish single-handed backhand that helped him beat French Open champion Stanislas Wawrinka in the last eight, but Djokovic was unmoved. 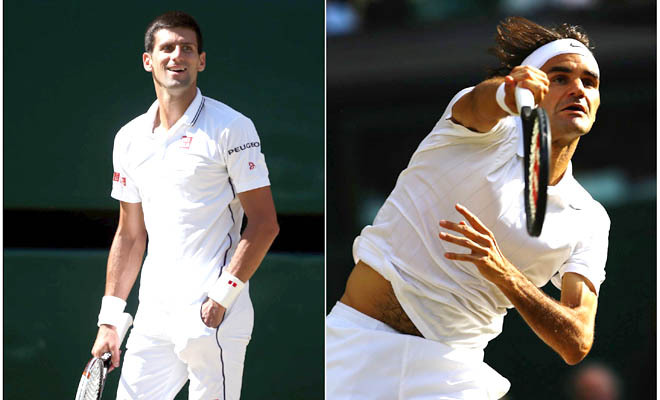 Despite needing treatment on his shoulder during the second set, defending champion Djokovic's place in a fourth Wimbledon final never really appeared in jeopardy. It looked ominous for 21st seed Gasquet when he lost his opening service game but he hit back immediately with a rasping backhand winner and earned himself a tiebreak. Some untimely groundstroke errors from Gasquet rather gifted Djokovic the breaker 7-2. Djokovic dominated the second set but offered the Frenchman a glimmer of hope at 5-4 when he went 0-30 down, only to slam the door shut with some pinpoint serving. With an inevitability about the outcome hundreds of fans left their seats at the end of the second set to revive themselves for the blockbuster semi-final between Murray and Federer later on centre court. Djokovic did not keep them waiting too long, closing out a 12th win in 13 matches against the gallant Gasquet with a single break of serve in the third set after two hours and 20 minutes. Federer does not lose Wimbledon semi-finals and he produced a display of clinical majesty to down Murray and maintain his bid for a record eighth title with a sparkling 7-5, 7-5, 6-4 win on Saturday morning. The second-seeded Swiss reached his 10th final at the All England Club with a near-perfect demolition of home favourite Murray to set up a repeat of last year's showpiece decider against world number one Djokovic. "It's been tough. Andy has been playing very well for the season," Federer said. "I'm unbelievably happy ... I played so well on the biggest occasion today and that's probably why I won it. "I've been serving very well for the entire tournament. I kept the pressure up, I went for my shots and was able to mix it up the way I usually do it. It all worked out very well." Federer, who has won all 10 of the semi-finals he has played at Wimbledon, will now resume his rivalry with Serb Djokovic in the keenly awaited decider. Djokovic rates Federer the greatest ever player and says the Swiss great has made him a better player. "He's one of the people that actually made me a better player," Djokovic said. "In the matches against him, I went through a lot of different emotions and things that allowed me to understand what I need to do to become a better player and to win against him and win grand slam trophies."